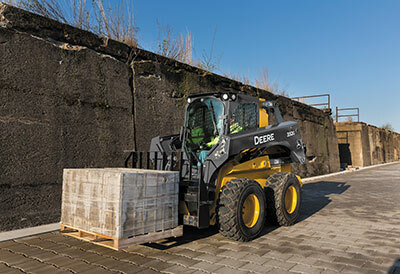 John Deere introduced its severe-duty pallet forks, the latest additions to the lineup of Worksite Pro attachments. Two new pallet forks—PF45 and PF60—are optimized to work with John Deere G-Series skid-steers, G- and E-Series compact track loaders (CTLs) and another pallet fork that was specifically designed for use on K-Series compact wheel loaders with the skid-steer-style Quik-Tatch coupler. The new pallet forks are also compatible with most competitive models. The severe-duty pallet forks for skid-steers and CTLs are available in lengths of 48 and 60 inches, and they can be positioned in widths from 45 inches, in 5-inch increments, to 60 inches in 5.35-inch increments. They feature a walk-through backrest with a bolt-on option, unrestricted visibility to the fork tips and skid-resistant steps. With the universal, self-cleaning Quik-Tatch easy attachment system, found on all John Deere skid-steers and CTLs, the machine can easily add and remove the severe-duty pallet forks. The new fork frame was specifically designed for use on a compact wheel loader with a parallel lift. The tines are ITA class 3B rated and available in either 1.22 meters or 1.52 meters. The new forks are backed by John Deere parts, service and warranty coverage.